OpsCenter is a Web application for monitoring and administering all nodes in a Cassandra cluster from one centralized console. OpsCenter runs on the client-side in a web browser. From the Nodes section of OpsCenter, select different views (Ring or List) of the nodes that comprise a DataStax Enterprise cluster and perform node management. View the status of agents, install and upgrade agents, and troubleshoot any agent issues in the Agents view. Use OpsCenter to run operations on nodes in an easy to use, visual way that takes the guesswork out of properly managing nodes in a cluster. Restart the DataStax Enterprise service on any node. The Ring View displays a cluster as a ring of nodes from which you can determine at a glance node health, data distribution, and datacenter balance within a single visualization. List View is an alternative to the graphical Ring View. List View provides faster access to data and more flexibility when viewing data. All data is updated in real time. View the status of agents. Agent status automatically updates as the information becomes available within OpsCenter. Add an alert to notify when a node has been marked as down by OpsCenter. Configure an alias for a node to display throughout OpsCenter and Lifecycle Manager. Monitor Spark jobs and access the Spark console from within OpsCenter. Configure an alert to monitor KMIP error status. Decommission a node using OpsCenter Nodes administration. Manage keyspaces and the tables within keyspaces. Restart the DataStax Enterprise service on any node. Restart a node from the nodes list menu in the List View or from the Node Details dialog using the Actions menu. Click cluster > Nodes > List tab. Select the check box for the node or nodes to restart. 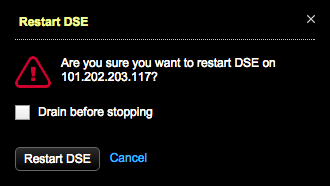 The Restart DSE dialog prompts you to confirm the restart. Optional: Indicate whether to drain the node before stopping and restarting.